I am very fond of writings about domesticity. I also love those scamps at Bloomsbury. 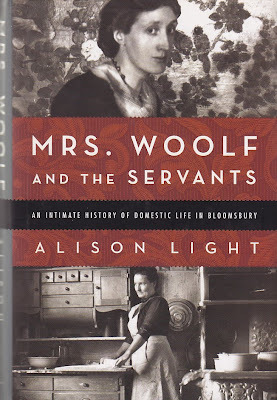 So when Alison Light published a book about Virginia Woolf AND her servants, well I was simply beside myself. As a child, I longed to live at Bloomsbury, well more pointedly Sissinghurst Castle with summers at Charleston. Virginia was always a bit too dour for me. As with most childhood fantasy, I longed for the imaginary Bloomsbury, where everyone slept with everyone else, children were raised communally, wine flowed and talk was of books, painting, and gardens. Tea was served promptly at 4 o’clock or perhaps 3:30 if we were idle or maybe 5 if we were planning a late supper. In my fantasy, life was idyllic and all was right with universe. In my dreams I never saw the faces of the people who brought the tea, weeded the gardens, or ran out to fetch painting supplies. They never spoke, they never appeared, they were the ghosts of my story. In a way, they were ghosts in the Bloomsbury story. Woolf and Boxall had a long and tumultuous relationship marked by fighting, firing, quitting and in the end a strange affection for each other. With all their liberalism in politics and lifestyles, the Bloomsbury set loved their live-in servants. The fact that they were paid sub-par wages, that they were treated much like chattel, that their lives were deemed somehow insignificant, never seemed to matter. 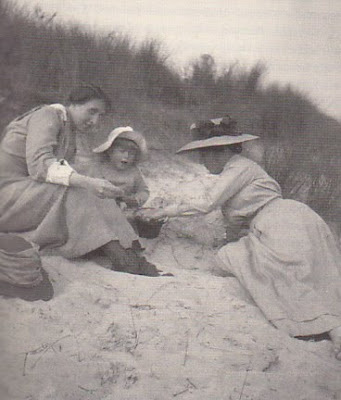 Virginia Woolf once got the idea of replacing Nellie Boxall with Grace Higgens, the maid and cook at Charleston. Instead, she sent Boxall to study with the famed French chef, Marcel Boulestin. You know my attachment to cookbooks and I would love to have a "Bloomsbury" edition, but alas, there exists no Nellie Boxall cookbook. 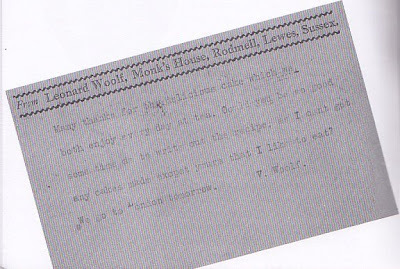 It was often said that her ice creams and crème brûlées kept Virginia Woolf going. Grace Higgens did keep a collection of recipes. 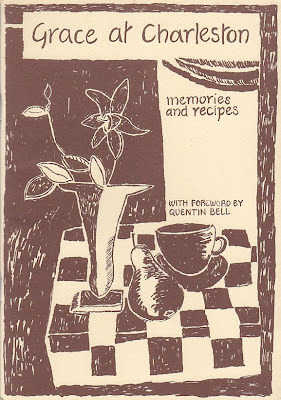 The small booklet features her recipes and a nice introduction by Quentin Bell. Grace at Charleston is featured at Cookbook Of The Day. 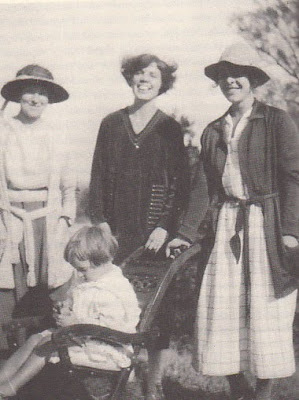 It is ironic with Virginia Woolf's desire to have a "room of one's own" that she never envisioned such a room for the women who worked and lived with her. It is hard to imagine an era where such total disregard is practiced while preaching something entirely different. Well, not too hard to imagine, but still a bit disconcerting. The era between the wars fundamentally changed Britain. Education become more readily available and young women who in previous centuries were headed off to become the chattel of grand houses now saw the possibility of expanding work opportunities. If you are fan of Virginia Woolf or domesticity or both, do give this book a read. Loved this post. I so agree with you and LA's comments that "a life of her own" so to speak did not apply to all women. I think Kathryn Stockett's "The Help" finely illuminates where the real wisdom sometimes resides. Fabulous and interesting post-have complete letters and diaries of VW which I am saving for my old age-0might add this to them to complete the picture. I must say, it is a bit disconcerting to find Virginia such a pig, especially since she is lauded as such a feminist icon. The Down East Dilettante: My favorite author as a kid was André Malraux! My friends today tell me how lucky I was NOT to have gone to school with them as they assure me I would have had a lot of time to read stuffed in my locker all day! Came back to reread this today, and Lucindaville I loved your last comment. The image of you stuffed in a locker contentedly reading Malraux has been my best laugh of the day. All across blog world, I am charmed by the stories of childhood readers. We may be the last children who were. Andre Malraux? I think we can now safely award the precocity trophy. Your Malraux trumps my Vizcaya any day. I too loved this post. The phrase that caught my eye was 'those scamps at Bloomsbury'. I haven't heard the word scamp for years and it totally sums up them up. and construct any narrative you like. but I do remember reading Virginia Woolf more than once commenting on how awful conditions were for Victorian and Edwardian servants, and the great sense of guilt she felt about it. It was in her opinion the great social question of the day. Whether she liked or disliked this or that particular servant is neither here nor there.